When Mitt Romney strapped his Irish setter to the roof of his car in 1983 and drove all the way to Canada as the dog defecated in fear, he couldn't have guessed his decision would follow him for decades, enraging animal lovers and raising questions about his character and management style. Sure enough the dog incident has gotten a lot of press (Gail Collins has mentioned it 19 times in her columns) and is sure to be a favorite topic among Romney detractors during his 2012 campaign for president. 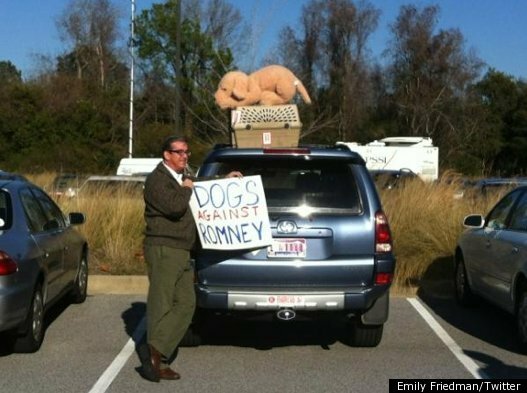 On Thursday, a Romney protestor in South Carolina strapped a stuffed dog to his roof, as seen below in the photo by ABC's Emily Friedman. See a photo of the late Romney dog, Seamus, here.